Tomorrow night, the good folks at Fenchurch and Bristol natives Chemical Records will take over Start The Bus, in celebration of their collaborative T-shirt and the opening of the new Fenchurch store. 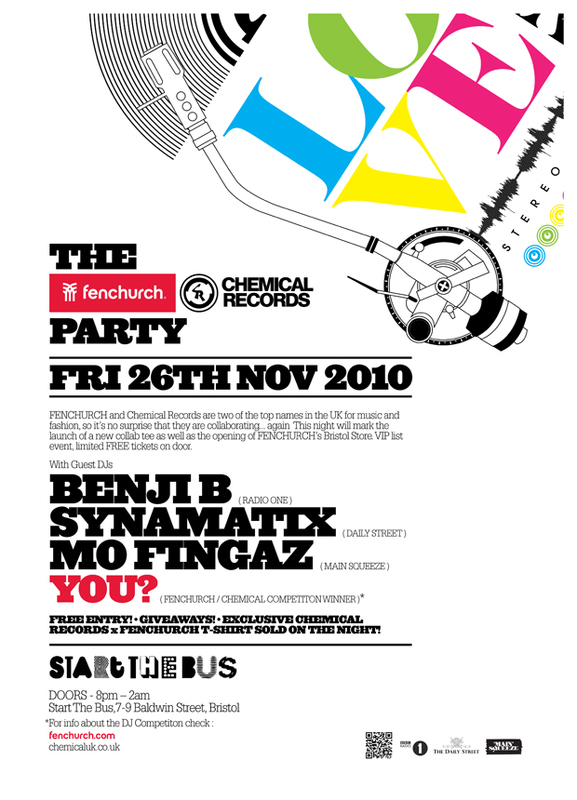 Our very own Synamatix will be DJing alongside Mo Fingaz and Benji B and the Fenchurch x Chemical DJ competition winner. It looks like it’s going to be a real fun night in the super chilled surroundings of Start The Bus and we’re looking forward to having Synamatix representing The Daily Street in Bristol. This is a super exclusive, guestlist only event, but we have 4 guestlist spots (for you and 3 friends) to give away. If you want to come down and join the party, just send an email titled ‘FENCHURCH X CHEMICAL’ to competition@thedailystreet.co.uk with your name and contact telephone number before lunchtime tomorrow. Winners will be selected at random and will be notified by phone tomorrow afternoon, but please be aware, you’ll have to make your own way to and from the venue. Make sure you check out the Fenchurch x Chemical Records collab tee and stop by the new store when you’re next in town.